Well a week ago we headed to McMaster to see Neurology. We have not seen this neurologist since January 2007! The last time she saw A he was tiny and still on oxygen, so needless to say he has changed a lot in two years! When we used to see this doctor way back and the discussion of A’s “episodes” came up she always felt that they were reflux related. We would see his GI and she would feel they were neurological. I felt pulled in all directions and didn’t know what to think. However today after giving her an overview of the past couple of years since she has since him, it has become very clear that these “episodes” are not reflux related at all. That in my mind is the only thing that has been ruled out with what could be going on with him. She agreed that she did not believe they were seizures but that we should have another extended video EEG. Of course nothing happens quickly and she didn’t think that it would be until Spring! So all in all not an appointment that seemed to get us anywhere but I didn’t expect it to. She did tell us that there was one little boy who she remembers that there were no answers for. It is tough for me to think this about A but at the same time all I can do is continue to do what I am doing and advocate for him and his needs. So the past few weeks I have been trying to put A in his Pony walker. It is quite funny because initially he HATES it and screams but once he realizes that he can move he is fine. He has not figured out how to turn it or back up so he does get frustrated when he hits something and can’t push through it! haha But lately his thing has been going into the kitchen. Maybe this is because he doesn’t ever go in there so it is exciting for him, but nonetheless it is adorable! He gets SO excited and starts babbling away as he is entering the kitchen and then he heads right to the back patio door. As you will see in the pictures at the bottom, it is priceless. I can’t even look at those pictures without tearing up. The things so many of us take for granted and yet a child who can’t just walk to a door and window and look out takes so much pleasure out of it. 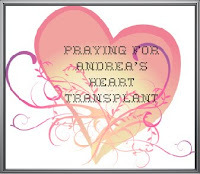 This entry was posted on January 19, 2009 by A's Mommy. It was filed under Uncategorized and was tagged with neurology, pony walker, spells. These are great pics, Shannon. It’s so lovely to see Ashton up and on the go and I love the one with his doggy! 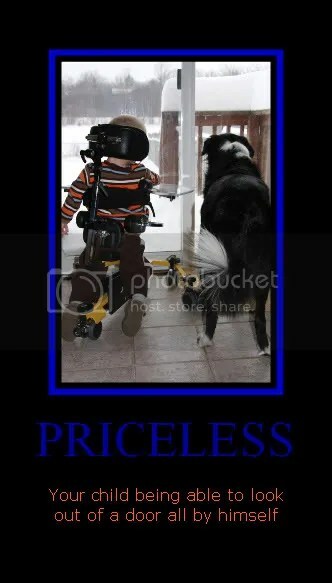 Totally priceless. I love it. It is amzazing how much we do take for granted. Way to go Ashton. It is priceless. I love the pic with the dog, it is so sweet. Priceless! You got that right Shannon!! You go for it Ashton!! I love the pictures and I really like your pony!love Sean M.